I had a long day travelling, yesterday. It seemed that I was just following history's flow, and letting it take me where it willed. It was a long day, though, and I'm slightly knackered at the moment. Started at 9.30 catching the train from Avondale to Newmarket West, then a climb up to the Domain Hill near the museum, where I found "Kaitiaki" again. A kaitiaki is a guardian, as Wikipedia explains. The Domain has a number of artworks on display (I'm rather fond of open-air art museums, as readers will probably have guessed by now). This, from that last link, is about "Kaitiaki." "This sculpture belongs to the tradition of abstract Modernist constructions which invite spectators to engage with the aesthetics of sculpture in its own right – its form, material, weight and scale. But of course it also represents a hawk. Fred Graham observes that birds were the original Tangata Whenua of Aotearoa, and the hawk has figured prominently in the oral traditions of Ngati Whatua and Tainui. 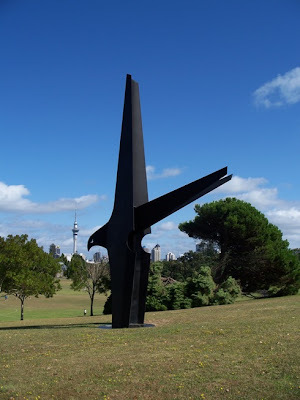 The enormous swooping steel bird, dark against the sky, may seem threatening, but conveys the strength that makes the hawk a powerful guardian of the land." Interesting that my day began yesterday with photographing "Kaitiaki", a sky guardian, and ended (after I'd been to Waiheke Island to a friend's birthday celebration) with looking up at the sky over the Waitemata Harbour on the ferry home. It was nighttime, and the sky between Waiheke and the start of Auckland's light pollution was first cloudy, then cleared to give a view of the constellation Orion and a mass of stars behind, part of our galaxy. For the first time ever (I've lived in Auckland all my life, in amongst light pollution at nighttime) I was able to pick out orbitting satelites, I'm certain. Their light vanished with the increasing light from Auckland as we neared the North Shore and central city. Still, for the brief time when it was possible to see the blanket of stars and those tantalising swiftly travelling lights in the sky, it was a wonderful experience.